Since the 1934 season, the Buccaneers have called Strong Stadium their home. 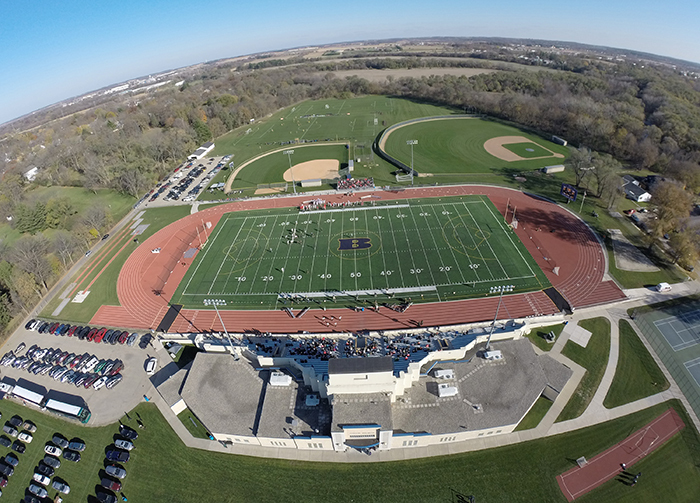 Located just a few blocks east of the Beloit College campus, the stadium was a gift of Mrs. Josephine Strong in memory of her husband, Walter Ansel Strong (‘05), a trustee of the college for almost two decades and the former publisher of The Chicago Daily News. Given Mr. Strong’s long and supportive relationship with his Alma mater, as well as his interest in athletics, it seemed most fitting that the stadium be named in his memory after his sudden death in 1931. The site was known as Keep Field from 1890-1915 and then Hancock Field from 1915-34 before gaining the name it has had for 70-plus years. As designed by Maurice Webster, Mrs. Strong’s brother, the stadium’s contemporary poured concrete construction and series of intriguing ramps and passages represented a sharp departure from the Victorian and Georgian facades of most previous campus architecture. The then-1,600 seat stadium was dedicated on October 13, 1934, with much fanfare and served two years later as the setting for the city’s centennial observance for several nights running. Besides football contests, the stadium also hosted the Beloit Relays, a premier midwestern college track & field meet which was initiated in 1937, as well as serving as an outdoor cathedral for religious services held in conjunction with a national meeting of Congregational and Christian church delegates. Over time, improvements were gradually made, including updated locker rooms and heating and cooling systems in 1964. Gradually, the stadium capacity has been increased to its present 3,000-seat setting, necessary especially for the always large Homecoming Game crowds each Fall. During the Summer of 2011, the Stadium received a major upgrade with the installation of a turf field and a new track. The Stadium stands were also cleaned and repainted. The upgrade is thanks to $3.7 million in donations provided by a small group of alumni, friends and parents of Beloit students.